The 5Mpixel Sony Cyber-shot F707 camera with a 5x zoom is now making way a new model named F717. 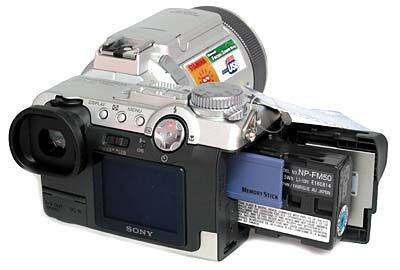 But no marked changes were brought into the successor, and fans of the Sony's camcorder style can choose any. 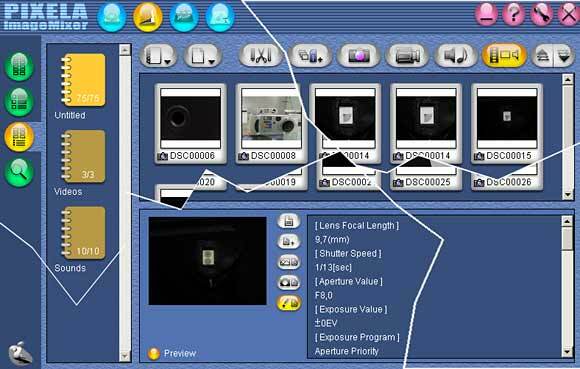 Main technical characteristics of both photo cameras are compared in the following table. 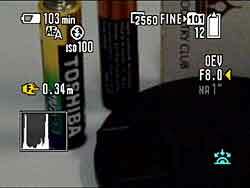 On the photo hardware level, lens/matrix, there are no changes. But we've got higher sensitivity of ISO800, a short exposure of 1/2000 s at a more or less "closed" aperture in the auto modes, faster USB, a white balance for the incandescent lamp, and "fluorescent" instead of "indoors", Multi Burst mode, unlimited MPEG HQX instead of a 15sec one. 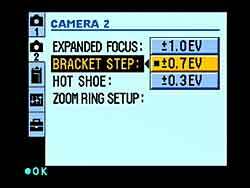 But the most useful features are histograms in shooting and viewing modes, a hot shoe and 5 selective focusing points. 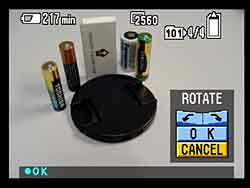 The zoom and manual focusing control system is changed. The two-position zoom switch is now horizontal, and the focusing ring can control zoom in the auto focus mode which photographers are accustomed to. 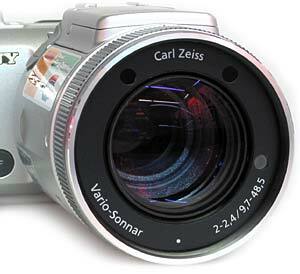 There is still a 2x zoom - the faster you turn the switch, the faster the zooming. The buttons are the same, though placed differently. The F707 is on the left, and the F717 is on the right. The bigger ribs of the focusing ring of the F707 make the grasp easier, and the camera's color attracts less attention of strangers. 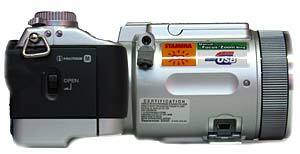 With the F717 you can use an ordinary flash instead of a special one, like for the F707, - HVL-F1000 with a sync cord for the Sony ACC connector which also supports a remote control. The built-in flash can pop up automatically. 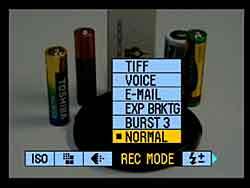 In all modes except the auto one (priorities, manual exposure) the built-in flash works at exposure values allowing for daylight illumination (they are long, and shots will most likely be blurred if a tripod or back lighting are not used). 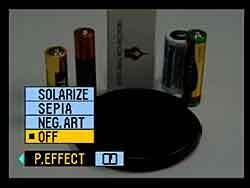 The battery pack uses the infoLITHIUM battery Sony Stamina NP-FM50 7.2 V, 8.5 W which must suffice for 2500 shots and 2.5 hours of operation until next charging (according to SONY for the F707). On the back we have an optical viewfinder and a display, display mode buttons, a menu button, a viewfinder/display switch, a multiselector for menu navigation and flash modes, shot viewing mode, timer and macromode. Under the viewfinder is a door hiding an external power connector and a video/audio output. Next to the release button is an exposure correction button (a small one) and a settings selector (exposure, aperture, exposure correction which is selected by pressing). Shooting modes: manual exposure, shutter speed, aperture priority, flexible program, green zone, scene (twilight, twilight portrait, landscape and portrait), video. Additional positions of the disc selector: camera's settings and viewing mode. Next to the mode switch and the power arm there are a microphone and a speaker. 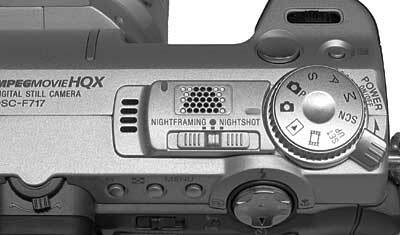 Below, the casing incorporates a NightFraming-NightShot lever. 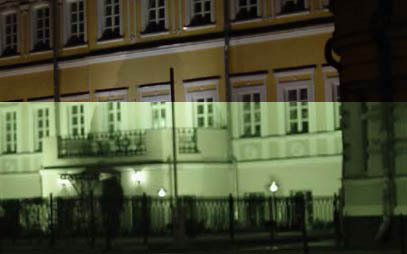 In the nightframing and nightshot modes the camera uses infrared shooting (an IR filter is mechanically removed from the optical system). In the former mode after framing in the IR range the IR filter returns to its position when the release button is pressed, the flash turns on and the camera makes a shot, and in the latter mode the camera shoots in the IR mode. The nightframing is meant for only one possible shot - after concealed aiming the flash clicks giving light while popping up (if it isn't raised in advance). The lens has two infrared illuminator LEDs (above) and a laser illuminator of the holographic "assistant" of passive focusing (on the side). 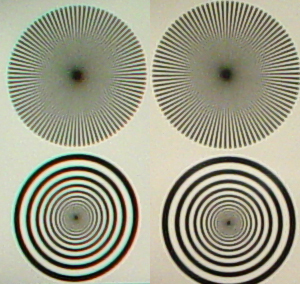 Modulated light of the laser backlight creates an accurate picture on the target for the auto focus (the recommended distance from the object is 4.5 m). The same shot in the normal and nightshot modes. The body of the camera is just a small part of the lens, that is why the tripod's socket and the USB connector are located on the latter. 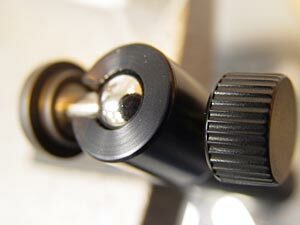 The tripod connector has a locking hole beside a threaded one which is important for such a weighty and lengthy camera. The body can rotate around its horizontal axis (at the right angle to the lens's axis) by 77 degrees upward and 36 downward, which lets you raise the camera above or lower it. 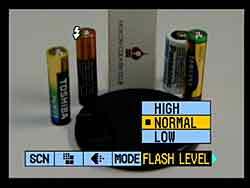 A round connector behind the flash is an ACC connector of the remote control and of the flash. 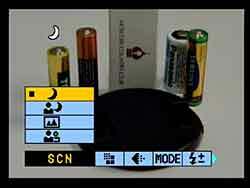 As now we have a hot shoe the flash and remote control can be used simultaneously. Viewing. Multi burst, slideshow, magnification, DPOF (Attach DPOF printing information to image), deletion, protection from accidental erasure. 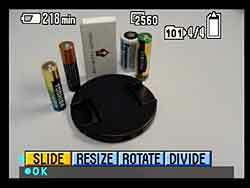 A shot can be rotated or resized and video can be divided into two clips. 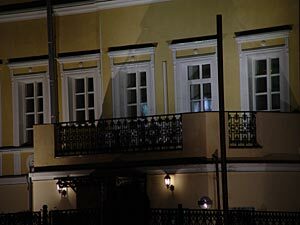 One of the scenes is night shooting. 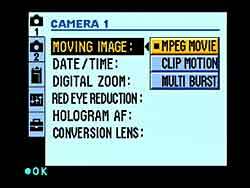 Movie modes: MPEG movie, GIF animation, and series of shots. Other settings: adjustable data/time, digital zoom, redeye reduction, hologram autofocus mode, add-on lens. 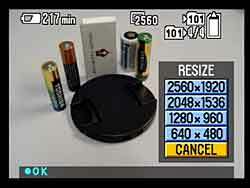 Photo shooting formats: TIFF, sound, shot for E-Mail, exposure bracketing, burst, normal. In the BURST3 mode you can get 3 shots at a little more than 1 sec. 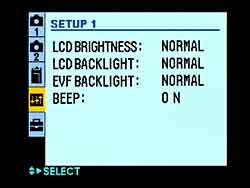 Second page of settings: image enlargement in manual focusing mode, bracket step, hot shoe, direction of rotation of the zooming ring. Next menu page (memory card shown): formatting, folder to store shots in (creation, editing). Adjustment of display and sound. 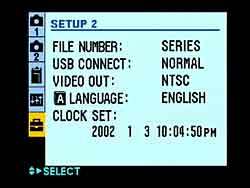 System settings: file number, USB (normal and PTP), video out (NTSC/PAL), language, clock/date. Shooting of the resolution chart in transient light. Edge and center of the TIFF frame for f = 9.7 mm, f/d = 8. Fragment 1:1. Exposure 1/13 s, noise elimination forcedly enabled. Coordinates of the center of the radial resolution chart for the frame edge: x = 116 y = 142, for the frame center: x = 1285 y = 820. On the edge there are geometrical distortion and chromatic aberration. Noise. 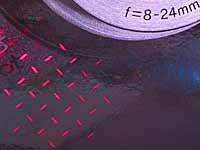 Automatic noise reduction works forcedly starting from 1/25 s. Fragments 1:1 of JPEG FINE files. ISO 100, exposure 1 s.
ISO 800, exposure 1/8 s.
ISO 100, exposure 1/8 s. Nightshot mode. The black coloring matter is almost unnoticeable in IR light. In the macro mode at f = 9.8 mm it's possible to focus on an object with 5.2 cm along the long side of the frame, at f = 48.5 mm - 16 cm. In the BURST 3 mode a series of 3 JPEG FINE shots of the maximum size can be taken at a bit more than 1 sec, the next series is in 12 s. In the normal shooting mode (auto focus, auto exposure, exposure 1/125 s) such files can be shot in at least 2 sec. 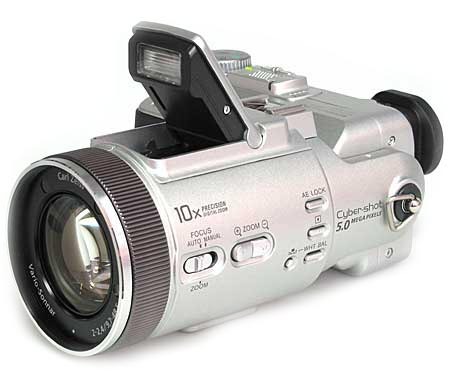 The camera comes with software for delivering data into the computer (USB driver, Image Transfer) and for processing data on PC (Pixelia Imagemixer). With the Imagemixer you can look through digital shots and video/audio clips, edit them a little, create digital multimedia albums, printable templates with frames and text, shoot video and make photos on PC via USB. In this case you should go to the service center to have your Hologram AF parameters corrected.